Indeed, I just put the (very few) necessary plugins for a very light script, and it works! Hi, UI seem clean and wonderful to use. Wondering if there is any way to add function on GUI to precisely limit the max bit rate of an encoding or the option is just not possible on x264 and we are stuck with unconventional way of limiting vbv maxrate+bufsize? x264 does not have a "maximum bitrate" option (other than the VBV options). And the options available in the GUI are, of course, a strict sub-set of the options that x264 offers. → section "Constrained Encoding (VBV)"
There was of course no way of knowing whether you were being watched at any given moment. How often, or on what system, the Thought Police plugged in on any individual wire was guesswork. Last edited by LoRd_MuldeR; 26th December 2018 at 14:22. Thanks for explaining on x264 and linking the vbv related articles, I got a better understanding of using vbv now. Mainly the problem that I'm facing is how to properly define the buffering model for different types of video. Like there is a CBR/2pass encoding to get accurate targeted average bitrate even though the quality will differ in encoding different sources, so I was looking for a similar function that can produce constant result for max bitrate, and perhaps there is something that I did wrong, I can't seem to get that with vbv. I can cope with the fact that it maxes out the maximum bitrate, but in my case, sometimes it will exceed it depending on sources and that's what troubling me. Last edited by Rocinante; 26th December 2018 at 15:00. If you use 2-Pass RC, there normally is no need to set VBV at all. And the same applies to CRF mode. In other words: VBV can only make the resulting video quality worse. In the best case, VBV won't affect video quality in a noticeable way. But, certainly, VBV restrictions do not improve video quality! Streaming: Here you necessarily need to avoid bitrate "spikes" that exceed the available network bandwidth in order to ensure "smooth" playback. Hardware Players: These players read video data from the disc at a certain (maximum) speed, and they have limited buffering capabilities. So, again, strong bitrate "spikes" are to be avoided in order to ensure "smooth" playback. Last edited by LoRd_MuldeR; 26th December 2018 at 16:05. Yes, I understand vbv is hurting the encoding quality and I can get accurate average bitrate with 2pass RC, but not maximum bitrate. I'm in a third case scenarios now that due to a website streaming policy, they request a limit for a "maximum bitrate" value (such as all video max bitrate needs to be below 15Mb/s and below 8Mb/s average bitrate) instead of matching buffering capabilities or like a certain fixed vbv value used in bluray. Last edited by Rocinante; 26th December 2018 at 16:47. That's exactly the "streaming" scenario. So, VBV is what you want/need here. As said before, there is no such thing as an "instantaneous" bitrate. Instead, a "bitrate" is always an average, computed/measured over a certain time interval. More precisely: Every picture has a certain size, in bits, in the encoded bitstream. And, whenever the decoder is about to start decoding the next picture, we have to ensure that all bits required to decode that picture already are present in the buffer. That's what VBV is all about! And that's also why "--maxrate" (i.e the network bandwidth, i.e. the max. rate at which the buffer can be filled) is not useful without knowing/setting the "--bufsize" (size of the buffer) as well. Last edited by LoRd_MuldeR; 26th December 2018 at 19:53. Since the x265 3.0+ versions, my simple x264 / 265 launcher gives me an error and I can not run an encode. Here is the error that appears. With versions 2.9, no problem. [2019-01-14] [13:20:08] Job started at 2019-01-14, 13:20:08. [2019-01-14] [13:20:08] FAILED TO DETERMINE VERSION INFO !!! @LoRd_MuldeR: Please add this option to x265 GUI, thank you. I'm sorry. I am stupid. Did not read the documentation before the question. Only one question, is it possible to "Custom Encoder Parameters" input make in two lines, or resizeble? Last edited by redbtn; 19th February 2019 at 07:37. With x265 3.0 I'm seeing this error and can't run an encode. [2019-03-19][16:18:40] FAILED TO DETERMINE VERSION INFO !!! Launch with --skip-version-checks, no problem with x265 v3.0 builds here. Each times I launch the program, I see now a dialog with "Your version of Simple x264 Launcher is more than 6 months old!" and the Discard button is disabled, so the only choice is to click the Check for updates button. After the long check, the answer is always that I have already the latest version. Frustrating ! Could you please release a new version, just to get rid of that irritation dialog, and with the possibility to click the Discard button in the future ? Thanks ! Sorry, I'm panning to release a new version soon. Simple x264 Launcher is 100% standalone, i.e. it does not require Mircrosoft.NET, Java Runtime Environment or other "external" dependencies. 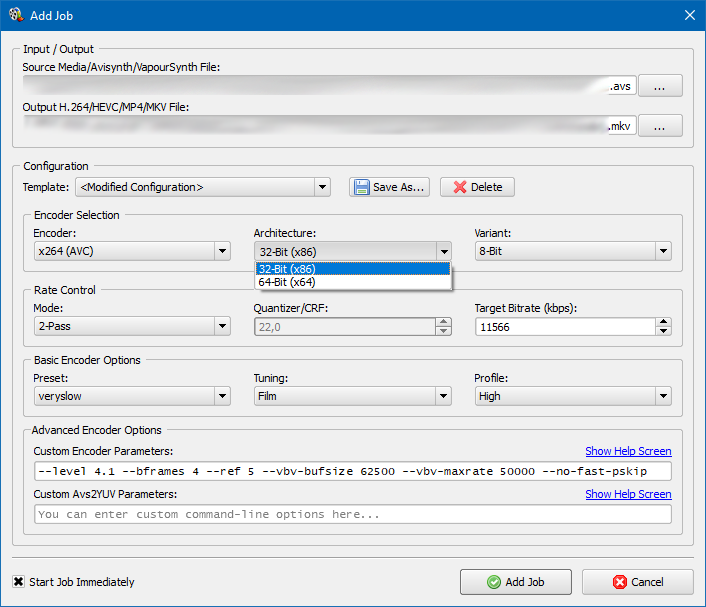 The required Qt DLLs as well as the encoder binaries are included with the application. Frameservers, like Avisynth or VapourSynth, may need to be installed separately though. Windows Vista with Service Pack 2 or any later Windows system – note that Windows XP is not supported anymore! Avisynth input only available with Avisynth 2.6 installed – Avisynth 2.5.x is not recommended! VapourSynth input only available with VapourSynth r24+ installed – Python is a prerequisite for VapourSynth! The latest program using x264-2935 which released 25-Sep-2018. However newer version is available: x264-r2969 released 12-Mar-2019. Can "x264_x86.exe" file be exchanged in "C:\Program Files (x86)\MuldeR\Simple x264 Launcher v2\toolset\x86" directory to a new one with changing name of course? Also can the "x264_x64.exe" exchanged? Going to work it properly? Anyway I did never try it, so are there any encoding speed advance by using 64bit architecture? Last edited by szabi; 16th April 2019 at 21:24. Probably yes. Anyway, a new build of Simple x264/x265 Launcher will probably be soon™. It was a really quick answer during editing my post, thanks.